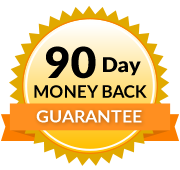 Already own the DVD Massage Therapy for Fibromyalgia? Call us at 1-800-364-5722, 9am to 5pm, to discuss your enrollment options. Fibromyalgia and Massage prepares massage therapists to safely and conscientiously work on clients who have fibromyalgia. Fibromyalgia and Massage is designed to provide the massage therapist with a thorough understanding of this highly variable syndrome in order to provide the best care possible to his/her clients. 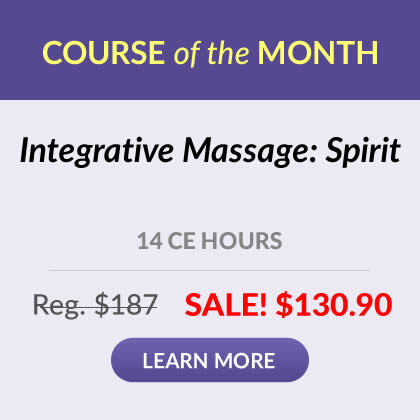 This course serves massage therapists with fibromyalgia clients on three levels; specification of techniques to include in a session, encouragement to seek further education in complementary modalities and referral ideas for clients needing additional support. Participants will learn the working definition of fibromyalgia syndrome, and the complexities involved in its isolation. Understanding the coexisting and associated conditions better equips the practitioner in their preparedness for helping these clients. While no single causative theory reigns, the proposed theories of why people get fibromyalgia are discussed. With over 500 references, this book is a comprehensive compilation of modern research, varying therapeutic perspectives and many approaches for managing this challenging condition. Also covered are the coexisting conditions, topical balms and salves, intake forms and checklists, plus exercises, stretches and other valuable patient self-care recommendations. In addition to the 300 page manual, the course includes a 118-minute video which discusses the syndrome and demonstrates massage strokes therapists can perform on clients to help alleviate symptoms. The objective of this program is to provide the background and framework necessary for a massage therapist to design a customized management plan for each fibromyalgia client. A crucial element of this framework is uniform assessment, application and re-assessment. Through evaluation of a client's symptoms, a practitioner will choose to apply certain massage techniques and will offer referrals for specified complementary therapies. A thorough understanding of fibromyalgia helps develop the therapist's compassion, confidence and vision to effectively relieve its symptoms. An absolute must for any massage therapist who wants to meet the needs of their fibromyalgia clients. After completing this course, I now feel confident when a client approaches me about their syndrome. This new understanding of FMS has allowed me to be more empathetic and supportive of my clients. 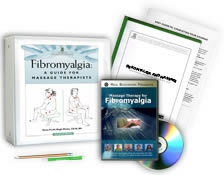 The course content was very interesting and thorough and provided me with lots of information to provide clients who I work with who have fibromyalgia. This information has helped myself and my clients better understand the multitude of varied symptoms they experience and how to work with them. The DVD was particularly helpful for me in evaluating the eighteen tender spots and the different massage sessions for sleep, pain and headaches. The course has been and will continue to be an excellent resource for my private massage practice. I also have found the fibromyalgia guide to be very helpful for clients and myself. Thank you for providing great classes. Huge success with my fibro patients! This course was much more in depth than I expected and I love that! I love to learn and always take over what is required in credit hours for renewal every 2 years. Thank you for an amazing study on fibromyalgia! Great course! Very insightful and complete. Looks at fibromyalgia from every possible angle! It was excellent, I learned so much, I loved it. I really enjoyed the course and believe that a great job was done with timely delivery and presentation of material… Thanks! Excellent material. Far exceeded my expectations... the information was outstanding, and I feel I can better guide potential FMS sufferers to alternative support, be it through my knowledge or a fellow expert. This course on Fibromyalgia was presented in such a professional manner. I truly appreciate the author's well thought out structure of the material. I also was intrigued with the coverage of the many modalities that can be used to help one with Fibromyalgia. Last year I was diagnosed as having Fibromyalgia and so the content was exceedingly helpful to me personally and I am confident that this information will help many of my clients who also suffer from this syndrome. Thank you very much. A lot of information presented. I have a much better understanding of what my clients are experiencing. The material in this course is immediately applicable in my practice. I gained invaluable knowledge into this frequently misunderstood pathology as well as additional information into treatment methods I have wanted to learn more about. Thank you!!!! I was looking for a fibro class and this answered many questions that I had. I also enjoyed the video. I love your classes, you offer a great variety. I do not like to take a class that just lets you scrape by. I like a class that adds to my knowledge base. I VERY much enjoyed this course. It brought together numerous techniques that can help in the treatment of fibromyalgia. It was very fascinating and interesting for me taking this course. Thoroughly enjoyed this. I feel so much more enlightened on this subject. This course would be a good refresher for doctors that are currently diagnosing fibromyalgia. This material is extremely helpful to my practice, as I see clients who have Fibromyalgia. I have read articles and taken other CEU courses on the subject but none went into the material in as much depth. I found the video very helpful as well. I found this course extremely interesting. It has allowed me a greater understanding of my patient's with Fibromyalgia. It will undoubtingly help me to provide better care. I really enjoyed this course. Thank you. As a long-time sufferer of fibro I have not only gained in knowledge concerning this condition, I am feeling a sense of relief as to my own my own ability to learn and study. This is a very informative course and very well put together. Thank you for the information. I was amazed at the content of the program and the intensity. This will be very valuable info for helping and instructing my clients with FMS. I am thankful for all the specific information presented in this program. I very much appreciate the video along with the written information. This course helped me increase my knowledge of this area. It kept my attention and was wonderful! Excellent course. I would recommend this course for any massage therapist treating clients with FMS. Awesome course! Very thorough and gives a lot of information to use as reference material. Thanks! Book was great, but really appreciated the video. The presenters were easy to follow and understand. I am grateful for the interesting and useful course content as well as the convenience and economy of the home study option. I found this course to be very informative. I learned a lot that can be used in my practice. Very informative, well written, and organized in an easy to understand way. This course was quick and easy to follow.